The exciting story of Earth Defense Fleet’s cadet’s call to action following an unexpected alien invasion has been brought to life in a new scifi audiobook by SciFi Publishing. SciFi Publishing is proud to announce the release of its newest scifi audiobook, Cadets. 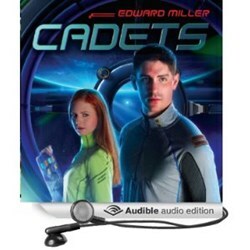 Cadets, written by bestselling author Edward Miller, is now available for sale on Amazon, Audible and Itunes. http://amzn.to/18hw32b. “The book provides well-rounded characters that learn to work together and solve problems practically... even the aliens aren't blank evil forces bent on destroying all life on other planets; they feel that they have a legitimate grievance. [Cadets is] enjoyable, fun, and full of adventure. This one really shouldn't be passed over." Rating: 9 out of 10 - Impact Online http://www.impactonline.co/reviews/1349-the-impact-review-cadets. Edward Miller is the author of the YA space adventure, Cadets, and co-author of The Kronos Interference, which was named to Kirkus Reviews Best of 2012. As chief editor for a sci-fi simulation website for over fifteen years, he has crafted hundreds of stories designed to take readers to new places and immerse them in mind-bending situations. He is currently working on a sequel for Cadets that he is hoping to finish it within the next 4-6 months. For more information about us and to discover other great audiobooks, like Jay Allan’s “Bitter Glory”, and “Dragon’s Banner” visit us at either http://www.scifi-publishing.com or http://www.scifi-audiobooks.com.